The more senses we involve in magical work, the more powerful spells become. 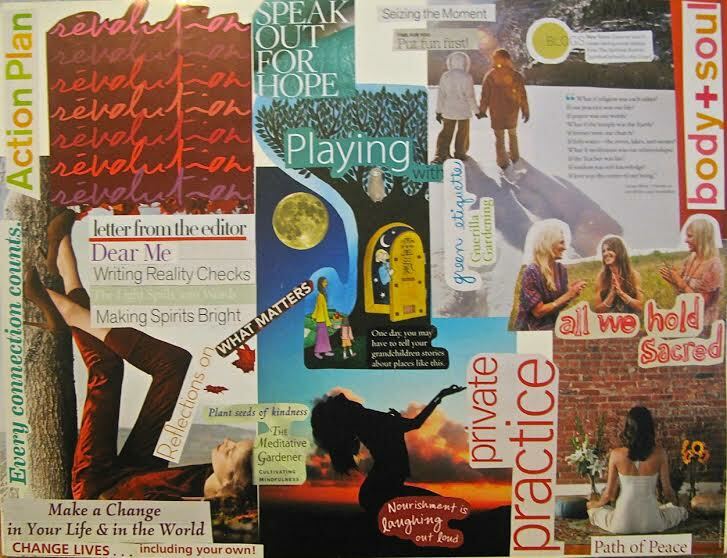 I have made frequent use of vision boards to illustrate what I was inspired to manifest. I flip through magazines (Oprah and Yoga Journal are two of my favorites. ), old calendars and books for pictures and words that grab me. If you don’t have a stash, look at tag sales and used book fairs held at local libraries. I have gotten old issues from my gym that were being thrown away, from co-workers and by helping myself to a bag of magazines put in the recycling bin at my condo. I try to remain open and not question why I am drawn to particular images or phrases, I just collect a pile in front of me. When it feels like enough, I go back through the items and begin to notice a theme. 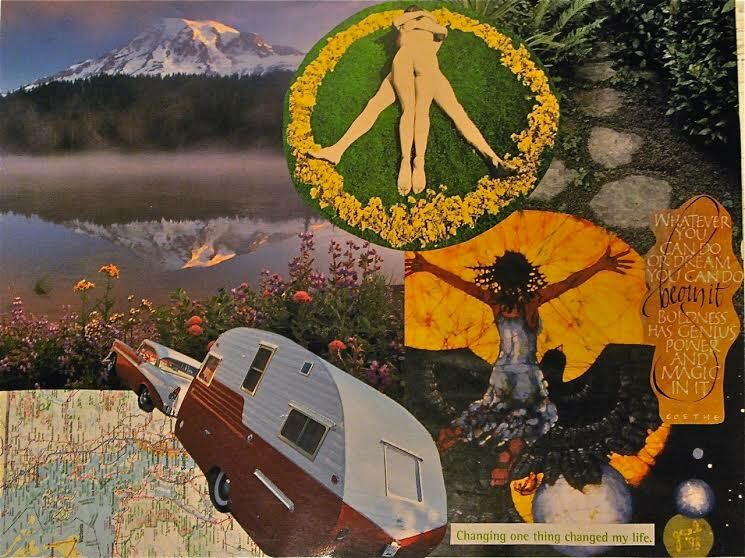 I play around, arranging the pieces in different ways until I am pleased with the result. Because I write for a living, words often dominate many of my boards. If you have a subject or theme you are working with, an area of your life that calls for attention – acceptance, health, the perfect job, abundance – focus on that as you select images that appeal to you. Choose those that get you to feel what it is you are invoking. The more relaxed and comfortable you are during the process, the better. Let it be enjoyable and leisurely. Light candles, play music, burn incense or employ any other ritualistic practice you find helpful. Using a glue stick, spray adhesive or other craft product such as Mod Podge, affix the pieces to a foam board, file folder or poster paper. You might even cover a shoebox or a glass cylinder. 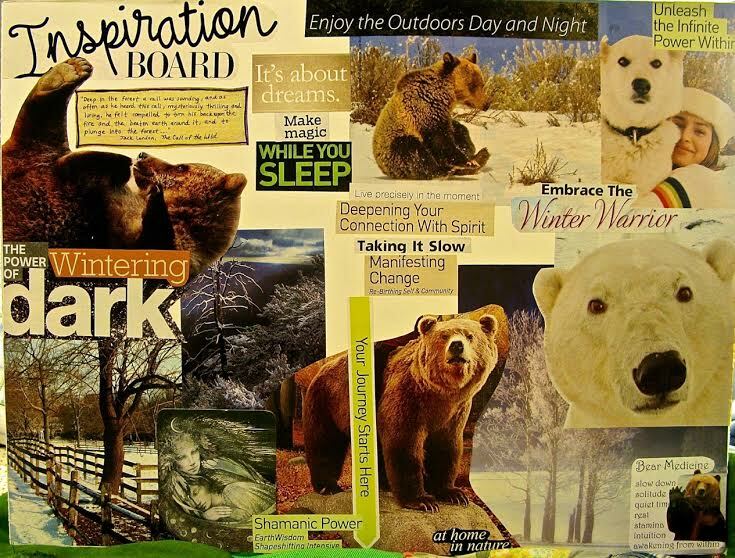 Images can also be pinned to a cork board, stuck on the refrigerator with magnets or taped to a mirror. The board itself does not do the manifesting, it’s aligning ourselves with the desire, experiencing the vibrations of having it, and going about acting on those inspirations that works the magic. These inspirational collections shift our focus. When you’re finished, spend some time not just seeing yourself in that reality, but experiencing it. In every cell, feel what it’s like to experience attaining your desire. Welcome it. Accept it. That’s the power of attraction. You can place your finished piece on your altar or put it on a shelf. Either way, it works because you have embraced all that it represents. 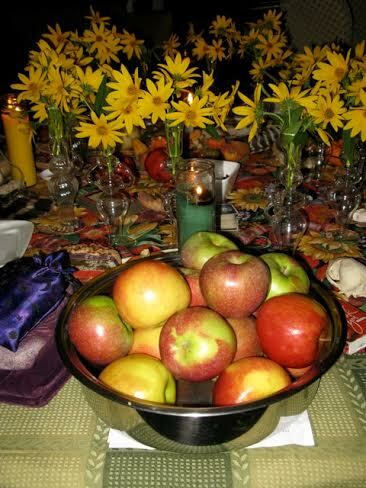 Mabon is the second of three harvest festivals of the year – the witch’s Thanksgiving – and one I find among the easiest for which to decorate. Walks in fields, forests and farms provide everything a well-dressed altar could need. Apples, for instance. There’s a wild apple tree growing by the lower parking lot at my office. Apples can be turned into candle holders for tapers, tea lights or votives. Sliced into thin horizontal circles, dipped in lemon juice and dried in the oven, apples can be strung to make garlands and wreaths. Peeled, carved and dried, they make shrunken crone faces for dolls or other crafts, or can be floated in a cauldron of mulled cider. Mabon is also known as the wine harvest. Wild grapes grow between a nearby school and park, as well as along the side of a street – all within a half mile of my condo. I collect the vines to drape on or about the altar. I’ll twist them into crowns and wheels of the year and let them dry. I’ve also wound them into small wreaths that later hung on my Yule tree. The flowers of the Jerusalem artichoke that grows wild in no man’s land at the back of the community garden have decorated my Mabon altar for free every year since I first found them. For me, they have come to symbolize the last warmth from the sun before it begins its journey into the dark half of the year. While it is a despised, invasive plant, bittersweet offers its bright berries at Mabon. There is some fighting for territory with the wild grapes, making it available for free. Acorns – a symbol for strength and power – are plentiful this time of year. I gather them freely beneath a tree at the office and from a sidewalk in the neighborhood where I walk. They can be put in a glass bowl with a candle, glued onto a wreath frame and used in crafts such as acorn fairies. Before working with them, though, they must be inspected for visible signs of bugs, also sorting out those showing signs of rot so that your finished product will not become moldy or infested with insects. After washing them, rub with a towel or brush to remove insect larvae and leaves, then bake the acorns in a single layer in a 225-degree oven for an hour and a half or two, turning every half hour or so to assure they dry. I like leaving the oven door a crack open to allow moisture to escape during the process. If after they are completely cool you would like to seal them, matte acrylic spray can be used. When the caps become separated as they most often do, they can be glued back on, or they can be turned into miniature candles by lining them up between the wires on a cooling rack and pouring in a small amount of melted wax. For a wick, stick in half of a small birthday candle. The same method can be used to make floating candles out of walnut shells. When harvesting from the wild, be respectful and never take the majority of something. Leaving a token of thanks is always appropriate. Consider placing one of everything you’ve gathered outside as a small shrine to thank the nature spirits for the bounty they helped provide.